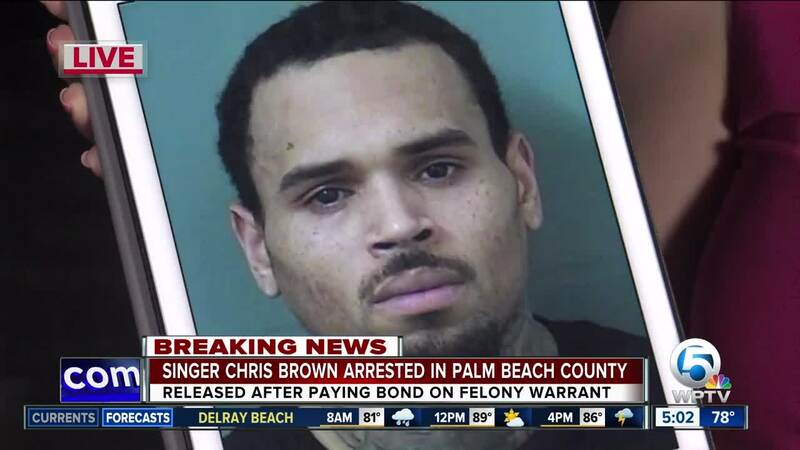 Singer Chris Brown was arrested in Palm Beach County shortly after he performed at a local concert Thursday night. Brown, 29, was wanted on a felony battery warrant from the Hillsborough County Sheriff's Office. Brown performed Thursday night at Coral Sky Amphitheatre in suburban West Palm Beach. TMZ reported deputies were waiting to arrest him at the conclusion of the concert. Jail records indicate he was booked at the jail at 11 p.m Thursday and released at 11:52 p.m. The Palm Beach County Sheriff's Office said the singer was released from jail after paying a $2,000 bond. Tampa police said the arrest is related to an incident April 17, 2017 at a Tampa nightclub called Club Aja where Brown is accused of punching a photographer. The photographer told Tampa police that he had been hired to take photographs at the club. The victim told police that Brown was sitting near him and the singer motioned him to move away. He said he moved away and attempted to tell Brown that he was hired to take pictures of the crowd. The photographer and witnesses said Brown then approached him, assumed a fighting stance and punched him in the upper lip. Brown and his entourage then left the nightclub. The singer is currently on a nationwide tour to promote his new album and scheduled to perform in Tampa on Friday night. 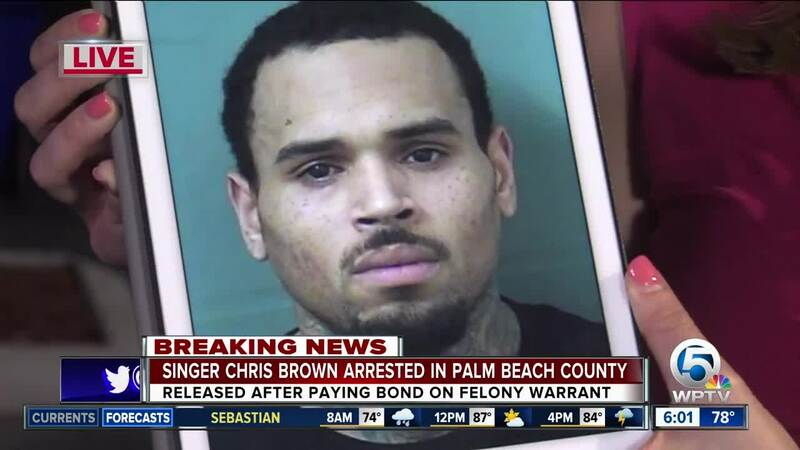 Brown has had several run-ins with the law, including physical assault charges following an incident with his then-girlfriend, Rihanna, in 2009. He was charged with felony assault and making criminal threats in that incident, and received five years' probation and community service.